Let me start off by saying that I mean this in the nicest way possible -- I am really enjoying the lurching process of building my MakerBot, and am more than happy to get the chance to work my way through the assembly of the machine. That said, if the MakerBot is the future, then the future is f*&@ing complicated. I have no doubt that February 26 will go down in history as a momentous day. On Saturday morning, after an evening spent fine tuning the current of my Thing-O-Matic's motors, calibrating the PID (don't ask) of the extruder to stabilize the temperature so that the plastic would be dispensed in a controlled, even stream instead of like toothpaste out of an almost-cashed out tube, and generally hoping that the next step was the last hurdle before I could proclaim my MakerBot alive. You may have noticed that, four posts into this series exploring life with a MakerBot, I've yet to actually print anything with my Thing-O-Matic. To make a long story short, despite my best efforts to resolve the problem on my own - which primarily consisted of testing the connections between the Arduino MEGA and the TOM's motherboard (the combined brain of the bot, these are responsible for processing the 3D model input and issuing commands to the other electronics in the bot), it turned out that the problem was beyond my capacity to fix. Sometimes, when I am really and truly immersed in something, I find myself making some truly banal, self evident non sequitur, but then treating them as if they are the most profound insights ever gleaned into the human experience. The last week with my dad has reminded me that this is a family trait. "Imagine getting a space ship off the earth." I'm going to let you in on a secret: this post is a composite of sorts. Because, as it turns out, when you are as cautious (and inept) at putting things together as my Dad and I are, things take a lot longer than projected in the Thing-o-Matic (TOM) instructions. The box sits unopened in my living room and I am feeling, if I am being perfectly honest, quite nervous about cracking it open. 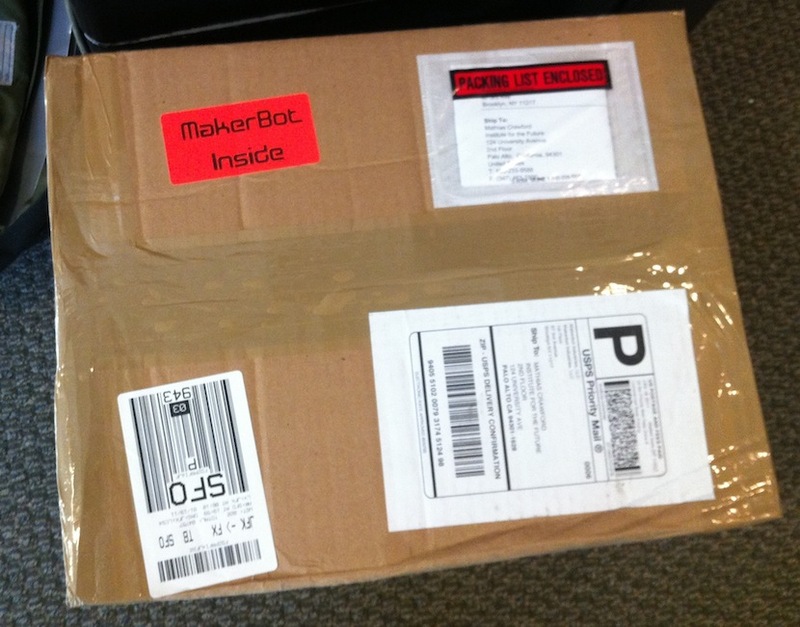 The sticker -- MakerBot Inside, in a futuristic font -- is undeniably cool. Cool in the same way that the availability of Joss Whedon's Serenity on the iPad is cool. But still cool nevertheless.